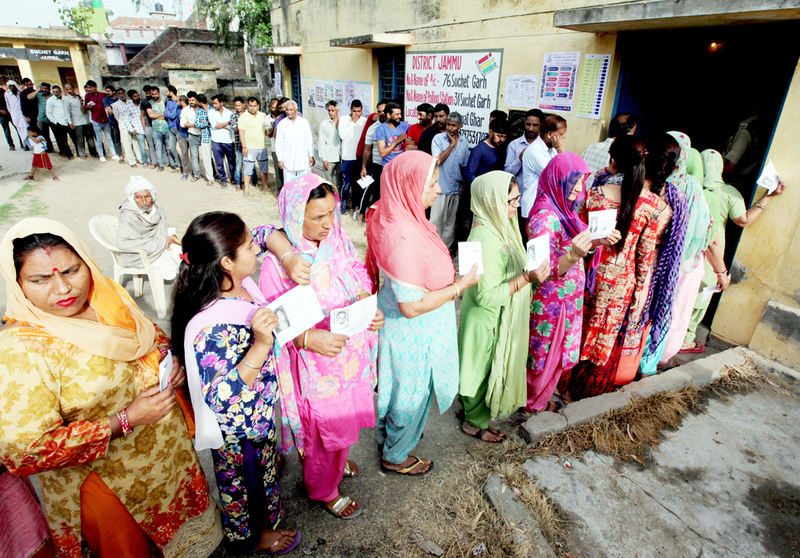 JAMMU, Apr 11: Jammu-Poonch Lok Sabha constituency, which went to the polls in first phase of general elections today, recorded heavy turnout of 72.16 percent with no incident of terror, violence or ceasefire violations on the borders reported from any part. Excepting complaints of malfunctioning of the Electronic Voting Machines (EVMs) at some polling stations, which led to delay ranging from an hour to four hours, the polling remained peaceful in all 20 Assembly segments and four districts of Jammu, Samba, Rajouri and Poonch, which formed part of Jammu-Poonch Lok Sabha seat. Out of a total of 20.05 lakh electorates, 14.47 lakh exercised their right to franchise in Jammu-Poonch seat with Jammu district having 11 Assembly segments accounting for highest number of 7.98 lakh votes followed by 2.76 lakh polled in Rajouri, which has four Assembly constituencies, 2.16 lakh in Poonch with three Assembly seats and 1.55 lakh in Samba district, which has only two Assembly constituencies. Samba district topped in voting percentage. 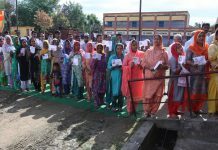 While 75.74 percent turnout was recorded in Samba district, the second highest voting percentage of 74.5 was reported in Jammu district followed by 70.4 percent in Poonch and 65.7 percent in Rajouri district. Of 20 Assembly constituencies in Jammu-Poonch Parliamentary segment, Chhamb seat accounted for highest turnout of 79.7 percent while lowest voting percentage of 59.4 was reported from Poonch Haveli Assembly segment. Addressing a press conference this evening, Chief Electoral Officer (CEO) Shailendra Kumar flanked by IGP Jammu MK Sinha, Divisional Commissioner Sanjeev Verma, Deputy Commissioner Jammu, Ramesh Kumar, who also happens to be the Returning Officer of Jammu Lok Sabha seat and SSP Jammu Tejender Singh, said overall voting percentage for Jammu and Baramulla Lok Sabha seats, which went to polls in the first phase, stood at 57.3. Jammu accounted for 72.16 percent voting, up from 69 percent of last Parliamentary election in 2014 while Baramulla recorded 34.9 percent voting, Shailendra Kumar said. He said voting percentage could undergo minor changes. 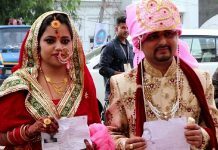 Today’s voting sealed the fate of 24 candidates, who were in fray for Jammu-Poonch Lok Sabha seat including Jugal Kishore Sharma, sitting MP (BJP), Raman Bhalla, former Minister (Congress), Choudhary Lal Singh, former Minister (Dogra Swabhiman Front), Prof Bhim Singh (Nationalist Panthers Party) and Badri Nath (BSP) among others. 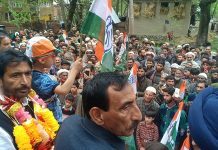 Jugal had won the seat in 2014 by a margin of 2.57 lakh votes defeating Congress stalwart and two-time MP from Jammu-Poonch, Madan Lal Sharma. National Conference, People’s Democratic Party (PDP) and CPM have supported the candidature of Congress nominee, Raman Bhalla by not fielding their candidate. NC had last time also supported the Congress. Fate of the contestants will be known on May 23 when counting will take place for all Lok Sabha seats of the country simultaneously. The voting completely passed off peacefully in all 2740 polling stations set up for 20,05,735 electorates. 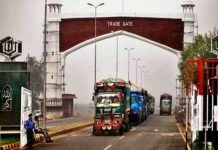 There was no ceasefire violations by Pakistan on the Line of Control (LoC) in twin border districts of Poonch and Rajouri, International Border (IB), which falls in both Jammu and Samba district and no election related violence. Only complaints of EVMs malfunctioning were reported from 50 to 60 polling stations in the constituency. The EVMs were replaced or their fault was rectified but it led to delay in start of polling by couple of hours at some places. 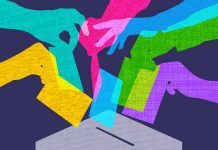 At a number of polling stations, mostly in the border district of Poonch and some polling stations in Rajouri, the voters protested against non-functional EVMs describing it as “deliberate act’’ on part of those at the helm of affairs to deprive the border people of their voting rights. 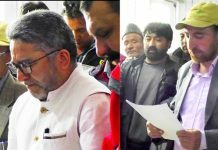 However, as the EVMs were either replaced or repaired and the polling resumed, the people were satisfied and joined in long queues to cast their votes. People also protested outside Polling Station No. 108 at Nanak Nagar against non-functioning of the EVM till 8.30 am. They called off the protest only when the EVM was replaced and voting resumed. Significantly, there were very less complaints of the people not finding their names in the voter lists as compared to previous occasions. Very few complaints of this nature were received, sources said, adding the majority of complaints were sorted out on spot. People were completely undeterred by any kind of threats by the militants or by Pakistan Army and Rangers as they turned up to cast their votes in large numbers even in the areas, falling within Pakistan shelling and firing range. 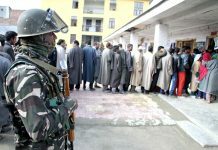 SSP Poonch Romesh Angral told the Excelsior that nine polling stations set up ahead of border fencing on the LoC in Poonch and Mendhar sectors, recorded brisk turnout with people enthusiastically joining queues and waiting for at least an hour to cast their votes. 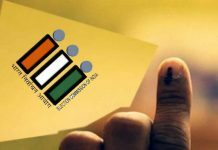 Authorities had identified 224 polling stations in Jammu-Poonch Parliamentary constituency, which were vulnerable to Pakistan shelling and firing. They had made arrangements for shifting the polling stations to alternate areas in case of ceasefire violations by Pakistan. However, not even a single polling station had to be shifted as there was no ceasefire violation by Pakistan Army or Rangers on LoC and IB respectively in view of strict surveillance maintained by Army and BSF. Responding to questions at the press conference, Chief Electoral Officer, Shailendra Kumar said the political personalities must verify facts before issuing statements. 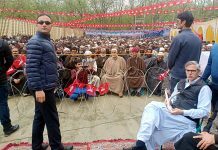 He was responding to a question on PDP president and former Chief Minister Mehbooba Mufti’s complaint that a BSF officer was forcing people to cast votes in favour of the BJP. Kumar said a defeated candidate of Panchayat elections was creating problem at the polling station in Poonch district. The BSF Assistant Commandant reached the spot and defused the tension. However, following complaint, a Magistrate was rushed to the spot and the Assistant Commandant was shifted from the polling station. On Dogra Swabhiman Front candidate, Choudhary Lal Singh’s charge of the administration being partisan, IGP Jammu MK Sinha denied the charge. On scuffle between voters and security forces in Poonch, Sinha said it was a minor issue which was resolved on spot and there was no formal complaint from anyone. Shailendra Kumar said webcasting was done at 484 polling stations today. 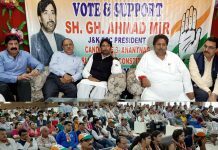 Replying to a question about fate of polling in Kishtwar, which is under curfew for past three days following killing of RSS leader, Chanderkant Sharma and his PSO, Kumar said hopefully the situation will be normal by the time of voting. Udhampur-Doda Parliamentary seat will go to polls in the second phase on April 18. 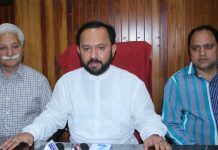 The CEO said the EVMs and VVPATs were changed wherever the complaints of non-functioning of the EVMs were reported in Poonch district or other areas. Asked whether any notice has been issued to BJP State president Ravinder Raina for violation of Model Code of Conduct, Kumar said he will have to check. 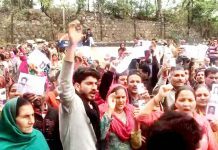 People in Balnoi in Poonch and Katarmal in Manjakote, Rajouri didn’t cast any vote till 12 noon as a protest against lack of development in the area. The Magistrates rushed to the spot and persuaded the people to vote saying their issues will be addresed, leading to resumption of polling.